Ostrow Lednicki is a lake island fortress in eastern Poland near Gniezno. The fort was the seat of the Piast dynasty which ultimately gave rise to Polish nationalism. The access to the fort was by two bridges, to east and west. The eastern bridge has been excavated and a zone of weapon finds discovered lyin gup to 350m out into the water and to a breadth of up to 70m. In 1038AD it was attacked by the Czech Duke Bretislav along its two bridges and was destroyed. The weapon finds are spectacular and include a 10kg byrnie and a helmet in excellent condition of conical-nasal type. The 58 spears include many Scandinavian examples and the excavators consider that there were Scandinaavians in the defending force either as allies, advisors or mercenaries. Two complete spear-shafts survive. They are 3.04m and 3.21m long. The excavators consider they would have particular value in the initial closing to combat. The general length of spears is assessed considering manuscript. monumental and archaeological evidence. The authors consider an average spear to be 2.0 to 2.5m long and some being shorter for throwing - they suggest 1.85m - and some being heavier and longer as with the complete shafts found. 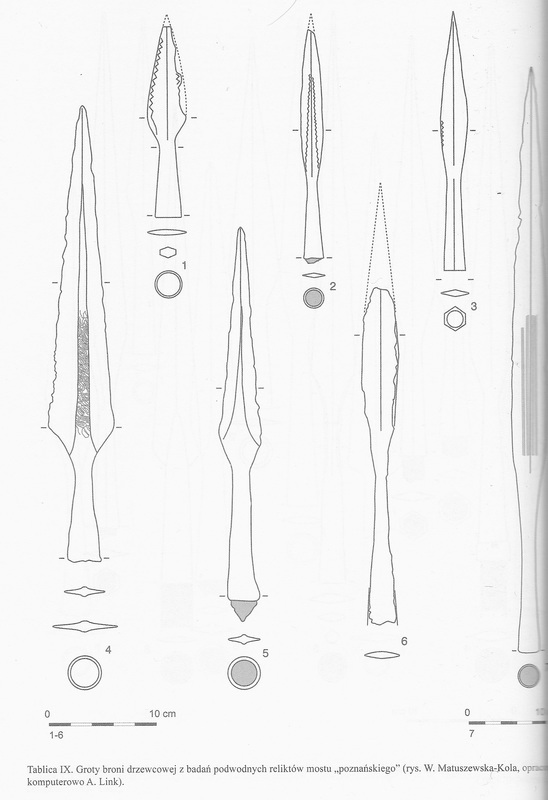 It is also interesting to note that the two shafts of similar length had very different spearheads on them. One (on the left in figure above) was a 45cm leaf-bladed head like a Petersen K but the other (on the right in figure above) had a simple 25cm diamond-cross-section 'ring piercer' of Nadolski's Type 1 - armour-piercing heads. The 5 swords found include a very 'viking' type and one of fourteenth century type. The other four can have been around in 1038AD. 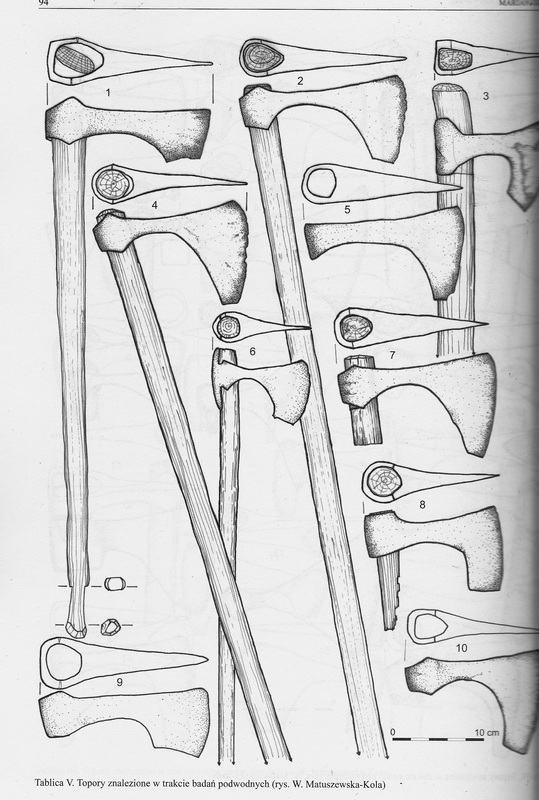 There were many axes and some have hafts surviving. There are no tiny very light axe heads. Most have shafts c.75cm.